Officials in China have cancelled the licences of seven animal parks and ordered improvements at 53 other zoos, parks and circuses. Officials found that animals used in performances were often abused and laws for their care often violated. Six government teams found mistreatment of animals, injuries to visitors and the illegal sale of wildlife parts. 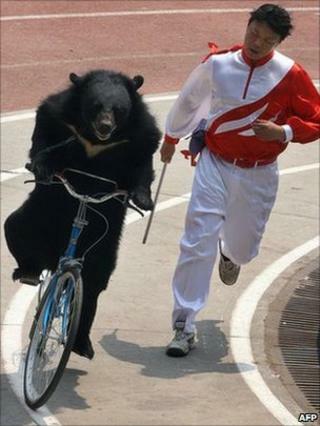 They had been inspecting about 500 animal parks after calling for a ban on animal performances. The country's first animal protection law is under consideration. The government's latest report found "frequent abuse and exploitation" of animals in parks and zoos. "Both the security of endangered species and the safety of the public are threatened by improper management," the State Forestry Administration deputy head Yin Hong told the official Xinhua news agency. Inspections found that poor management and illegal activities in some zoos and wildlife parks were increasingly causing the death of rare species. The China Daily quoted a campaign manager from the International Fund for Animal Welfare office in Beijing, Hua Ning, welcoming the zoo closures. "I believe many Chinese would be unhappy if they knew the baby tigers they hold in their arms for photos (in some zoos) have had their canine teeth pulled out," Hua said. "The government needs to help zoos and aquariums cancel some performances that entertain visitors but harm animals." Scandals highlighted by animal activists have included the starving to death of 11 endangered Siberian tigers at a park in Liaoning, in the northeast of China. A mass grave of animals, including tigers, lions and leopards, was found in Heilongjiang province; they had apparently died of malnutrition and illness.